The Turtle Flambeau Flowage Docks are scheduled to be taken out of the water sometime between October 22nd and October 31st. As you know our docks have suffered some damage from the ice the last couple of years. We have been working with the Northern Highland American Legion State Forest boat dock crew to repair and upgrade our docks. That crew will now be taking all of our docks completely out of the water each fall to prevent future ice damage. The boat dock crew is very experienced and has the manpower and equipment to take care of over 100 docks in Oneida, Vilas and Iron counties. What that means for us is that our docks will probably come out of the water a little earlier in the fall and go in a little later in the spring, but in the end we will have better docks for the public to use. All permits are in place. Ross Peterson is performing inspections of erosion control measures as required by storm water permits. Easements and legal agreements are in place with the Wisconsin DNR, Town of Mercer, and Town of Sherman. The Town of Mercer is in the process of bidding the paving. Bids were due Thursday, October 4. I have not heard results. At this point, it seems unlikely the pavement will be placed in 2018. Ross Peterson construction has mobilized, installed erosion control, and cleared trees for the project. Removal of most of the surface soils was complete on Wednesday. Ross Peterson sampled the proposed fill material at their pit and tested the gradation. Laboratory testing confirmed that the material meets the project specifications. Material has been delivered to the site and placement of earth fill commenced on Thursday where the subgrade was dry and firm. Due to recent rains, the subgrade is wet in the lower parts of the project and will need to drain and dry out. 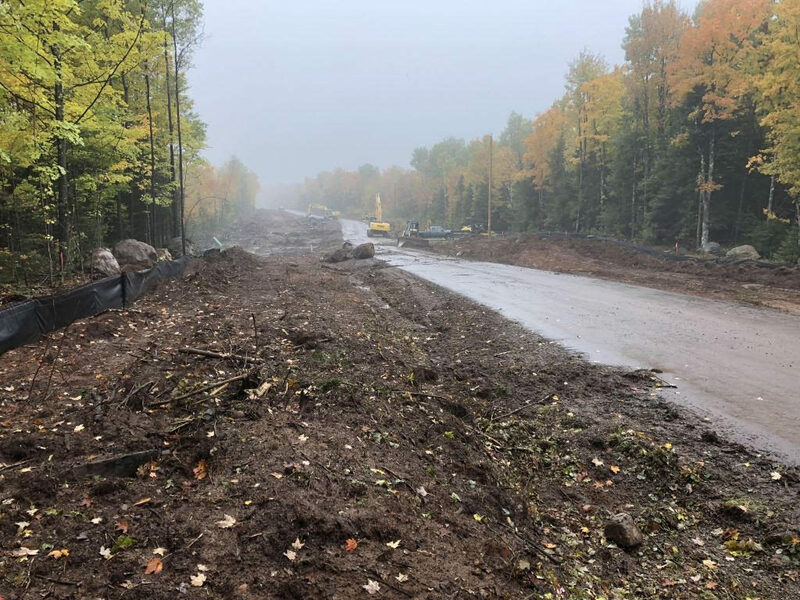 Ross Peterson still expects to finish constructing the embankment by the end of October, barring significant inclement weather. Rain is in the forecast most days through next Wednesday. The boat ramps remain closed. There are barricades and signs to warn traffic of the construction. One lane remains open for local traffic, dam operator/attendant, emergency vehicles, and DNR access. Ross Peterson has begun removing asphalt pavement, but the base course will remain to accommodate local traffic. © 2019 Turtle Flambeau Flowage & Trude Lake Property Owners Association. All Rights Reserved.